The Sands Harbor Marina provides dockage for boats up to 160 feet. Transit dockage is $2.75 per foot per day. Monthly and annual rates are available. Vessels under 30 feet have set rates, call for details. The marina is conveniently located right on the Intracoastal waterway in Pompano Beach. Cruise 5 minutes North to Hillsboro Inlet to access the sparkling warm waters of the Atlantic Ocean. Our coastline offers some of the best saltwater fishing in the world. We are located just north of the Alantic Blvd Bridge in Pompano Beach, Florida. 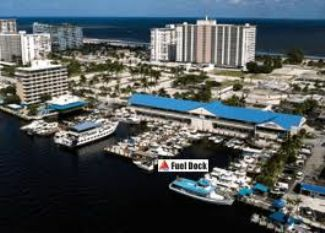 We are the Marathon Fuel dock, vessels staying in our marina get $0.20 off per gallon when fueling with are friendly staff. Sands Harbor also offers a Resort, Patio Bar, Pool, and onsite vessel repairs. For your convenience, the Sands Harbor Marina is open 7 days a week! Mostly listings charge by "Flat Rate" per month.